Ebooks have become quite common nowadays. More and more people read books this way. It is now possible to amass a library of books and have them handy in an ebook. But managing all those ebook titles can also offer some challenges. For one, not all ebooks come in the same format. It may be harder to manage the different formats in just one ebook reader. But it is not impossible to do so if you have the Calibre Portable Ebook Manager handy. 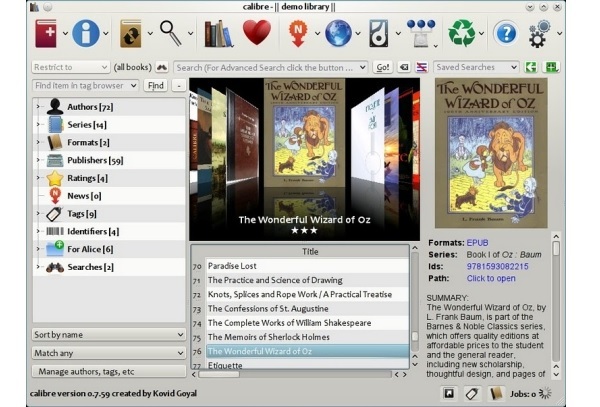 The Calibre Portable Ebook Manager is a software that helps users manage their vast library of ebook titles in a more convenient way. This ebook manager can handle ebook titles in different formats and manage them into a single virtual library. The program is portable so users can store it on virtually any device. It also acts as an ebook format conversion tool to make any ebook title compatible to any ebook reader. The program also works as a useful ebook viewer compatible with all ebook formats. The program also allows synching your ebook library to different ebook reader devices. Users can also obtain news from the Web and convert it into ebook form for easy reading on any ebook reader. The fact that the Calibre Portable Ebook Manager provides support for the different ebook formats makes it a very valuable tool. The way it can convert any ebook into any format makes it an ideal ebook manager to have for people with different ebook readers on hand. What makes the program even better is that it is available for free download.